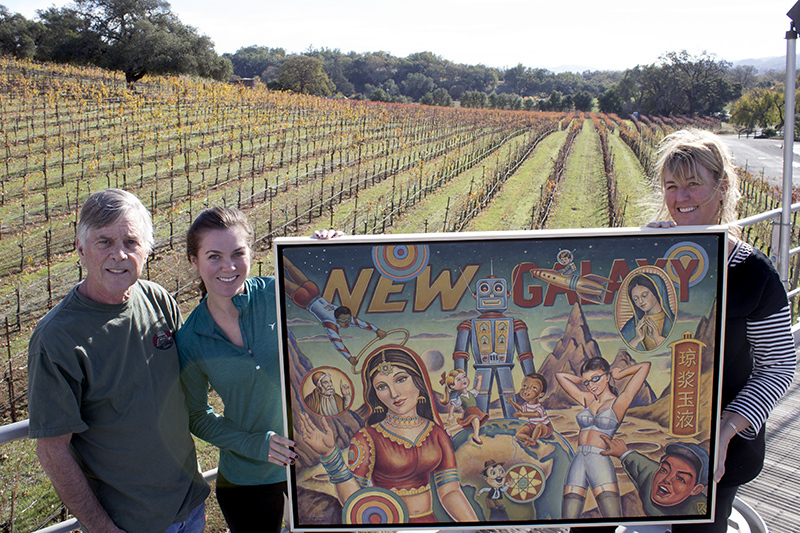 The fine art gracing the labels of Imagery Estate Winery's unique wines began 30 years ago as a project between a Glen Ellen winemaker and Sonoma State University art professor. Now, the highly regarded, 442-piece Imagery Estate Winery Permanent Collection comes full circle to Sonoma State University thanks to a generous gift from the Benziger family and a business partner, former owners of Benziger Family Winery. "It was always our hope that the collection would stay together and be exhibited in the years to come," says family member and former Benziger Family Winery President Tim Wallace. "We feel that Sonoma State is the perfect home for the collection." Together, the individual pieces in the contemporary art collection are valued at over $2 million, but its value as a complete collection is much more, says its curator and SSU art professor emeritus Bob Nugent. "It's a big collection with a lot of important artists and very wonderful pieces. I think it's going to be a valuable asset to the university." The collection features works by many significant artists from American contemporary art, such as Sol LeWitt, Robert Arneson, William T. Wiley, Pat Steir, Hung Liu, Nathan Oliviera, John Baldessari, Nancy Graves, Robert Hudson, Squeak Carnwath and several others. Many SSU art faculty are represented as well, including Nugent, Kurt Kemp, Mark Perlman, Stephen Galloway, Inez Storer and Shane Weare. "The Imagery Collection is remarkable and unique because the art in it is representative work from a cross-section of notable 20th and 21st century contemporary artists, all of whom marry their visual aesthetic in nuanced, subtle ways with the art of wine and winemaking," says Thaine Stearns, Dean of the School of Arts and Humanities. Nugent and winemaker Joe Benziger hatched the idea of commissioning fine art for a special collection of Benziger wine labels in 1984. Imagery has since become its own label, with its own Glen Ellen winery and art gallery. The collection has outgrown the space, however, and it was decided that it was time to find a new home where it could be shown and appreciated on a regular basis. "I wanted to keep the whole collection together in one place," says Benziger. "To have it so close to home at Sonoma State, which is developing such a great wine business program, that is very special. Our family is very proud that it's going to be there." The donation is the largest gift of art in the school's history and triples the size of Sonoma State's current art collection. "This donation is a symbol of the partnership built over decades between the university and the wine industry," says Ray Johnson, director of the Wine Business Institute in the School of Business and Economics at Sonoma State. "We're grateful to the Benziger family for their support and generosity, for the benefit of generations to come." Most are two-dimensional works, but some incorporate three-dimensional elements. Each piece was commissioned to become a wine label, but the only requirement given to the artists was the incorporation of the Parthenon, a re-creation of which stands at Benziger Winery in Glen Ellen. "I'm thrilled to have the Imagery Collection at Sonoma State," says University Art Gallery Director and art professor Michael Schwager. "It will be wonderful for the students to have a large collection to study and use to organize exhibitions." Plans are in the works to display pieces from the collection in the university's multiple art galleries and public spaces. Imagery Winery continues to operate at its same location with Joe Benziger as winemaker, and still commissions art. The winery remains open to the public for art viewing and wine tasting.